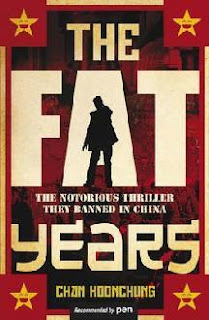 The Fat Years is a multifaceted commentary on a near future China, which is largely indistinguishable from the modern variant confronting readers today. Due to an unparalleled economic crash, this China is now entering a period of massive growth, and acting out its apparent destiny as the world's latest superpower. Against this background of economic prosperity, a variety of themes and ideas are cast. First, there is the mystery plot, featured in the book blurb - a month appears to be missing from the collective memory of the Chinese, and none of them seem especially concerned by it; a few individuals seem to remember the events of this `missing month' and attempt to investigate what has occurred. The pacing here is deliberate, but the central conceit is quite clever. A word of warning: some of the key `mystery' details are accidentally revealed in the preface. Whilst the preface is fascinating, and worth a read, I'd recommend looking at it as an epilogue instead. 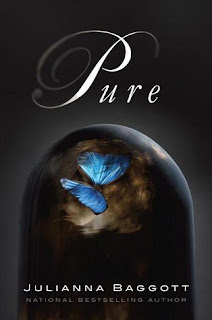 There is also a gentle romance plot playing out between several protagonists; it's slow, pleasant, and mature, and a thoroughly rewarding read. It served as a wonderful counter to the more popular `whirlwind romance' plots going around at the moment. Each of the participants has their own humanity and fragility exposed, and the prose that does this is wonderfully executed. Balanced against both of these plots, and interweaving with them, are themes and commentaries on the state of this `future' China. The most easily accessible is the apparent complacency of the future Chinese population, who seem to accept with little argument that China is the best place in the world - even as local courts are forced to meet quota's for executions. There is something of a parallel to the late British Empire here, which may be intentional; the contrast between late-stage Imperialism and the future state of Communism is startling more for the similarities than the differences. Our main protagonists are, by and large liberal (by the standards of their society), and the political message is less of a subtext in this book than an overarching theme. But the reader isn't left to suffer through polemic; whilst there are arguments presented about the intrusion of the state, the potential loss of liberty and civil rights, the author is careful to project several opposing viewpoints, arguments for stability over total freedom, arguments for pragmatism and economic success over a devotion to minority ideals. These certainly make interesting reading, from both sides, even if one is presented a little more sympathetically. This isn't a political screed, but it is a highly politicised text, with the rumblings of policy, decisions, and philosophical musings pervading the fabric of the world that the author presents us - and it is all the better for that. `The Fat Years' isn't the easiest read, but it is extremely intriguing, and well worth the time invested. Try it - just be prepared to grapple with different societal mores and conceptualisations. And remember to read the preface last! 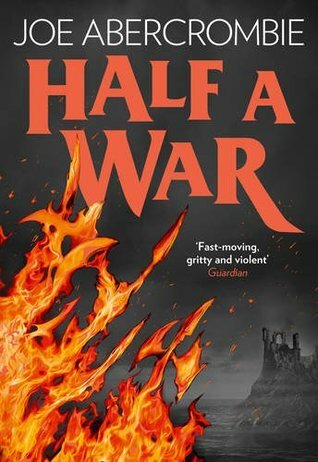 Half a War is the conclusion to Joe Abercrombie’s ‘Shattered Sea’ series. It’s wrapping up a saga of revenge, blood, love and honour. In short, it manages to do so in a thoughtfully thrilling, compelling fashion. There’s a new protagonist for this volume, Princess Skara. 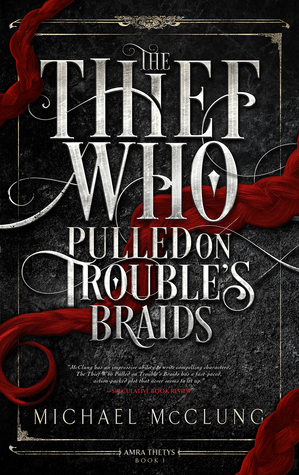 Originally a member of the elite, she becomes the victim of tragedy, forced on the run after the death of her family at the hands of the High King’s troops. Skara initially comes off as frail and terrified, a teenager with broken moorings, trying to find a feeling of sanity in a world which is now swirling out of control. Over the course of the text, though, she finds a path to becoming something else. Skara has charisma, a way with words, and moves from being fragile to near-ruthlessness. She’s become aware very quickly of the brutally final consequences of trust and failure in this world, and takes steps to armour herself against it, and to find her own revenge. Abercrombie manages this gradual transition masterfully, keeping Skara sympathetic as she slowly moves into a pragmatic ruler, her external actions not displaying the conflict in her heart, visible to the reader. She’s not got the furious energy of Thorn from the previous book, fighting with charisma and words rather than iron, but they share a lethal sense of focus. Alongside Skara we spend time in the company of Raith. Raith begins as a sword-bearer, but becomes involved with Princess Skara. He’s a seething ball of rage, a fist looking for a face to bunch. A berserker, a killer, and also a very damaged boy, trying to become a man – though never sure what sort of man he’d like to be. Raith prevents a face to the world, as Skara does, a nice parallel between the power of words and the power of blood. He also looks to Skara, in some ways, as a means of indicating what the right thing to do is, an interesting compromise of the moral imperative, given her own internal conflicts. Raith is Skara’s mailed fist, willing, even eager, to fight and fight and maybe, one day, die. But he’s also struggling with loyalties, to his new master, and to his old – and that conflict feels like it may rip him open. There’s some old favourites on display as well. Father Yarvi is in full on plotting-mode, spinning byzantine schemes out of thin air, to the despair of his enemies. Mother Wexen’s shadow falls across the conflict, a woman, like Yarvi, determined to do what she thinks she must. Thorn Bathu reaves and murders, and comes home to a husband standing in the light. As a supporting cast, they benefit from having been protagonists – and it’s a joy to catch up with them again as things move to a conclusion. Narratively, that conclusion is rather well done. There’s some absolutely top class siege scenes. Abercrombie has always known how to bring out the visceral terror and ecstasy of warfare, and wrap it into the larger context. The politics here is tense, the prose a complex and taut web of words. There’s a sense that the right word, or the wrong one, could bring everything crashing down. We see these characters that have been our friends or enemies over the course of the series, as they reach their ends – and it’s heartwarming in some cases, heart-breaking in others. But it’s always valid and genuine, the emotion from their closings as real as a fresh wound, and as undeniable. By the end, the situation in the Shattered Sea feels settled – at least for now – and we’re left to wonder what could happen next. Is it worth reading? Absolutely. As a conclusion to a series, it ends well, with great characterisation, a plot contemplative when it needs to be, but willing to give out its fair ration of fast-paced action, in a world that’s always been a pleasure to be involved with. So yes, if you’ve come this far, then this is a conclusion that you’ll want to read. 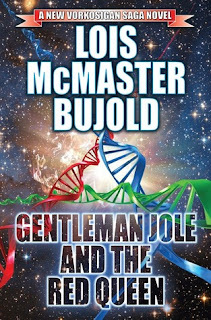 Gentleman Jole and the Red Queen is the latest in the ‘Vorkosigan’ series of books by Lois McMaster Bujold. It follows Admiral Oliver Jole, one time aide and friend of Aral Vorkosigan, as he struggles to decide which path his life should take, a few years after Aral’s death. 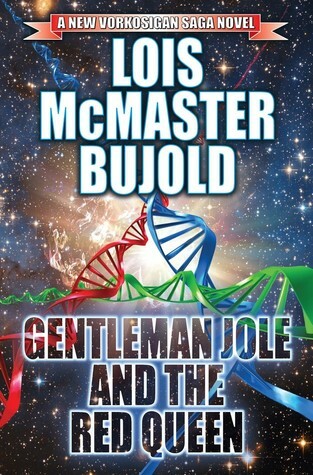 In the interests of full disclosure, I’m a big fan of Bujold’s Vorkosigan saga – a sprawling series, taking in several generations of characters over a variety of celestial geography. So I went into this book with a reasonable level of setting context and fairly high expectations. The universe of the Vorkosigans has been extensively detailed before now, but we get to see a more intimate view of it here. There’s some time spent in and around a lake, and each blade of grass and each rustic boathouse is carefully, intimately described. There’s a sense of age and place there, a feeling of sanctuary and closeness which has been carefully constructed. There’s a little bit of time spent in the orbital stations as well, and that had a sense of isolation and anonymity, but the core theme here is matched by the environment – a complex living thing, filled with contradictions, but vividly, vivaciously alive for all that – a hive of complexity and compromise, and a place that is beautiful and deadly in equal measure. But this is mostly a character piece. Oliver Jole is a middle-aged career military man, conflicted in his life choices. He struggles over whether to allow a child (or children) into his life, and over whether his days of having a meaningful relationship are now in the past. Jole is a rarity, a mature protagonist, not concerned so much with drama but with his own internal agonies. In that space, he succeeds convincingly, and completely. There’s a fatigue there, a character worn down a little by life, and an energy, a desire to see something better, to do something better with themselves. Oliver Jole is a man on the cusp of a life decision – but which direction he’ll go in is unsure. Part of that process is his relationship – built with the Viceroy of the planet he handles the military for, Cordelia Vorkosigan. They were both involved in a complex relationship with the same man, and both are now struggling to come to terms with love, life and loss in the shadow of that man’s death. It’s difficult to articulate how nuanced and accurate the author’s portrayal is here – there’s something of the more mature in the way Jole and Cordelia interact, a slow and cautious courtship, an ember bursting into gentle flame. It’s tactful, careful, and makes perfect sense given the context. In both cases, these are individuals driven by their past. Cordelia’s is familiar to Vorkosigan fans, but there are enough hints of previous pain and old wars here to allow a new reader to feel up to speed. Jole is largely new to all of us, but his internal monologue is convincingly charming, logical, and occasionally a bit fraught. He feels, in fact, like a man feeling his way into unsure terrain. There’s a certain veracity to his experiences, a sense of honesty which makes it all feel real – both the slow-burn of romance and the sharp agonies of old pain. The plot, really, is the characters. Their gentle dance is one which is a joy to watch, and in the meantime we’re treated to some charming and entertaining dialogue. There’s a smidge of drama laced throughout, sparking in the vision from time to time – but really, this is a character duet. It’s a tale of two people struggling to find love, whilst remaining secure in themselves – and in that, it succeeds marvellously. If you’re a Vorkosigan fan already, this one is well worth picking up, expanding the story of Cordelia and offering a whole new perspective on one of the key relationships of the series. If a new reader, I’d advise starting with the beginning of the series – but this works as a gentle romance with an intergalactic setting, and will reward the closeness of a new reader as well. Pure is a book set in the harrowing aftermath of a global cataclysm; its world is typically a bleak and empty one. The shattered remnants of the local authorities are engaged in child snatching for sinister reasons; the cities are shattered ruins, the land and water poisoned and, in some cases, actively hostile. The survivors shown to us in the text are just that - unflinchingly portrayed as barely eking out an existence, all crippled, physically and spiritually, by their continued existence in a world which has largely been reduced to a wasteland. In contrast to the physical bleakness of the survivors world the reader is given The Dome, a sealed environment which the devastation, somehow, did not touch. The people inside are clean, healthy, and happy - at least physically. The Dome exerts a pull over the minds of the survivors outside, a mixture of rage, hope and fascination which the author captures magnificently. And into these intermingled worlds, of the Dome and the shattered outside, are thrown several teenagers, all of whom are struggling to define, in some way or other, who they are, and if what they believe about the world is true. The author manages to write a remarkably compelling piece; I came in expecting a fairly typical coming-of-age novel with a little dystopian flavour, and came away in parts intrigued, disgusted and harrowed. This examination of a society after a nuclear firestorm is compellingly unflinching. The central characters carry a little of the `teen adventurer' about them, but this is gradually filed off as they move through the world. This text is, in some parts, an exploration of social, psychic and physical damage - and there isn't too much room there for the titular `Pure'. I won't give the story away, but will note that it starts off rather slowly, gradually acclimatising the reader to the characters and their new world(s) , before ratcheting up to a surprisingly tense and fast-paced second half. The prose itself is well conveyed, the language clear and concise, with each character a unique voice - even the minor characters seem unique. My only (slight) complaint was the discovery at the close of the text that it is to be part of a series; however, it works perfectly well as a stand-alone novel, so this is really a minor issue. Overall, this is a wonderful portrayal of a shattered world, the death and growth of hope, and the capacity of humanity to perpetrate great acts of evil, and small acts of good. Certainly worth the read - just don't expect to have an easy time of it. 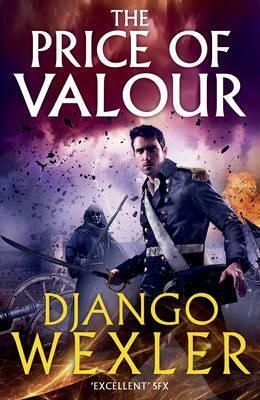 The Price of Valour is the third in Django Wexler’s Shadow Campaigns series – a character driven work of military fantasy. The world of The Shadow Campaigns is one somewhat reminiscent of France on the cusp of the Revolution, or the later Napoleonic period. There’s a growing sense of industrialisation, and collapsing of class barriers in a society previously heavily stratified. There are ‘new men’ rising through the military, loyalties unbound to the nobility, tied to the nation and the king – risen on merit. Events of the preceding texts have left society in turmoil – the King is dead, his daughter borne to the throne on the backs of a popular revolt, the traditional centres of power and control cast down. The book opens on an abstract maelstrom, a whirling potential for change, mixed with a deadly risk of failure. A good portion of the text takes place in the capital city of Vordan, now in something of a crisis. The people (or perhaps The People) have power now, electing a series of representatives to speak for them on issues. But in many ways, these individuals are powerless, as each faction seeks to establish a political monopoly, and the creaking strains of tyranny can be heard behind the political rhetoric. It’s an excellent portrayal of a capital coming to grips with a new political situation – opportunistic chancers grasping at the reigns of power, and idealists, faced with having to enact their ideals, teetering on the edges of blood-soaked mania. Outside of the city, we continue to get a detailed, sympathetic and honest view of army life alongside some of our protagonists. Their campaigns are still reliant on set piece battles, but there’s a lot of marching to do for those to occur – and rather a lot of blood, sweat and mud makes an appearance. It’s not all grim, and there’s an atmosphere of solidarity in the troops. But there’s struggles here too – especially in the clash of genders, as the all-female segment of the Vordan military continues to grow. Clashes between more traditionally minded officers (and men) and the women fighting alongside them add an opportunity to talk about gender and role expectation, in a rather nuanced way – though admittedly it comes alongside cannon fire and the occasional duel. From a character standpoint we get to spend some more time with Raesinia, now Queen, as she attempts to get a grip on her fractious, squabbling kingdom before it falls apart from internal disorder or external warfare. She’s somewhat harder now, a woman accustomed to taking action, and accepting the responsibility that the results of that action will require of her. But there are still touches of the younger version here and there, and a determined compassion which keeps her grounded and sympathetic. Then there’s Winter Ihernglass, whose rise through the ranks of Valnich’s army has been somewhat meteoric, if entirely deserved. She has a penchant for unorthodox military manoeuvres, and her authority in a public persona leaps off the page. But there’s a more fragile Winter shown here too, trying to make a relationship work with a woman under her command, a woman who doesn’t have the same respect for the army life, or her commander, as Winter does herself. You can feel their passion in their declarations of affection, and in the lethal silences embedded in their arguments. Winter is caught in a crux between duty and personal happiness, and her struggle to resolve this is painfully honest in prose. Valnich himself, the genius general, makes less of an appearance – seen more through his plans than in person. Still, watching him now, there are hints of an agenda, of a man who wants to shape something, create something. There are hints of a larger shadow over the man, whether his own legend or something else entirely – what we saw here was effective, but I want to spend more time with Janus Valnich. The villains range from the corrupt and venal, through the misguided, to the duty driven and dangerous. I wouldn’t say that they’re sympathetic; in most cases, they’re far from it. On the other hand, they are understandably malicious, driven by internally consistent goals, individuals, rather than massed ranks of evil. Appearances on the page were often met with a visceral reaction of dislike – a credit to the author’s crafting of their antagonists, I think! The plot – as ever, no spoilers. But Raesinia has to deal with complex internal issues within the kingdom, struggling to hold it all together. This gives us subterfuge, intrigue, and delicate political manoeuvring – as well as knives in the dark. Valnich and Winter have external threats, and there’s some more of Wexler’s painstakingly lavish battle sequences, which manage to provide a comprehensible strategic picture whilst also being inside of the emotional moments of combat. It’s a page turner for sure, each page a step along what is apparently a very high stakes game. I tore through it, wanting to know what happened next on every page. If you’re not into the series, and are looking for a piece of solid military fantasy, driven by complex, human characters, then this is for you. If you’re already caught up with the first two books in the series, then this one is a more than worthy successor – I’m already looking forward to the next one. 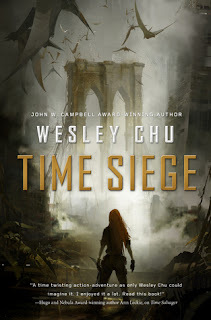 Time Siege is the second in Wesley Chu’s “Time Salvager” series (the first of which I reviewed rather favourably last year), which follows the troubled time traveller James Griffin-Mars, as he attempts to break free from the control of corrupt corporations and a broken Time Agency, and attempt to rehabilitate both himself and the future. The world of Time Siege is, well, in many respects not a pleasant one. Its Earth is struggling through seemingly endless ecological cataclysms – earthquakes, endless lightning storms and funnels over lakes, the omnipresent “Earth Plague”. This is an ecosystem on a precipice, and it’s to the author’s credit that it feels lived in and humanised, as well as potentially deadly. There’s some wonderful backstory laced through the text, part of character reminiscences or establishing moments - its built in organically, rather than through an infodump. We get an eye on several of the far flung colonies of the solar system, looking at both the successes and the rather unpleasant failures, as well as leaping into the past of Earth and…other environs. The other colonies are particularly revealing – the suggestion of a clean, stark Europa, a land of limited resources and absolute control, contrasted with stories of a failed state, one where laxer controls led to rule and obliteration by the mob. It leaves us, if not willing to countenance corporate control, at least able to understand the environment in which it has been fostered – where laxity may be fatal, and where the private sector controls the air you breathe. A dystopia, to be sure, but a plausibly human one, where those on both sides of the line don’t see themselves as villains. There’s a little time with pre-collapse timelines as well; we see Spain in the grip of a ravaging by malevolent AI, and the great space-faring conflict that threw apart humanity’s diaspora in a blaze of fire. Both end in fire and blood, and the heat and the reek of iron pour off the page. There’s quieter times too – a Venusian civilisation in slow decline is a nice touch – but it’s telling thta the further down this timeline we go, the worse things appear. We’re mostly dealing with the same characters as in the preceding book, at least initially. More room is given here to James Griffin-Mars, the salvager of the previous text, with special attention focused on his relationship with Elise, whom he rescued from a past catastrophe. James is…complicated. Acerbic, often unpleasant, a man with a selfishness ingrained by his own expected lifespan and the social pressures defining his universe. He is, if not a bad man, certainly an unpleasant one from time to time. He’s given purpose, at least in part, by Elise, whose view of things is more optimistic, coming from a time before the world was quite so catastrophically broken – to James she is, then, an avatar of hope. That she loves him, complex and cracked though he is, helps keep his personality on an even keel. But still, there’s issues – James suffers from substance dependency, from what feels like a stress disorder, and is clearly a man struggling with himself and his own worst nature. This is approached sympathetically, but unflinchingly – we have a protagonist with, to put it mildly, problems, and they are not ones which the text feels the need to ignore; in fact, quite the reverse. There’s an honesty coming of the page here, a rawness which gives James genuine humanity, flawed as he is. Elise we see less of, but she’s growing well into her new role – leading a people without much in the way of technology, on the run from mega-corporations that want her for some nefarious purpose. She’s compassionate, hard-headed, and willing to take risks. Over the course of the text we can see her steady evolution into committed leadership. Of course there’s other sparks there as well – her unfeigned affection for James, and concern for him, mixed up with her own responsibilities to the people around her. There’s a struggle here too, as she tries to have her own life, to improve the life of those around her – and to try and improve on the future. They’re more than ably assisted by a supporting cast of new and old friends (and enemies). I always enjoyed the acerbic wit of the Mother of Time, and it’s great that she gets some space on the page. But there’s others too – the group of youths bound to James by a need to learn, a desire for a father figure. The crotchety, wry Venusian doctor. The villains – oh my, the villains. There’s the director of the time agency, trying to muddle through under the increasingly grasping hand of the Valta corporation. And there’s the Valta Securitate, driven to perform atrocities, not for the sake of it, but because she believes they are necessary. There’s a disturbing humanity to the Securitate – she carries her own demons, and they drive her to do what Valta asks – perhaps more brutally than necessary. Still, she has, if not hidden depths, at least lightly stealthed depths, and manages to feel like both victim and horror. The plot – well, as usual, no spoilers. But there’s a lot going on. Urban warfare. Prison breaks. More time jumps. Chronmen using exo bands to explain the merits of their arguments – often fairly explosively. The text ramps up quickly, and thereafter it hurtles along gleefully, a joyfully breathtaking ride. It was a lot of fun to read – examining serious questions, but doing so interlaced with some great character scenes, and hair-raising action. By the close, things have once again changed rather dramatically – I’m already desperate for the next book in the series. Is it worth reading? I think you’d want to read Time Salvager first – but thereafter, yes, absolutely. There’s explosions. There’s fist fights. There’s sharp wit, and poignant dialogue. There’s people being, well, people, the best and worst of us, in a detailed, believable, broken world. It’s a great entry in the series, and left me wanting more. Give it a try. 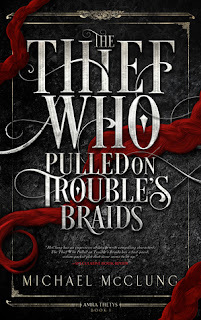 The Thief Who Pulled on Trouble’s Braids is the first in the Amra Thetys series by Michael McClung. Thetys is a competent thief, who uses her wits and the occasional application of force to stay one step ahead of the law. All she wants is to have a quiet life, and a decently sized retirement fund. Unfortunately for her, she’s going to have an adventure instead. Amra’s world is one of active magic, one where a cataclysm wiped out a major civilisation, and left survivors scrabbling to rebuild. There’s a fair amount of social construction under the surface – allusions to mass migration of refuges after a total disaster, for example. There’s also a fair amount of history, which is quietly laced through dialogue and world description – the odd mysterious ruin, references to long-ago conflicts, and so on. I wanted to hear more about Amra’s wider universe, but what there is provides valuable context, and acts as the bedrock for the more immediate descriptions. There we’re on safer ground – though the city in which Amra makes her home feels familiar, filled with arrogant nobles, snotty policemen and slithery criminals, it’s still sufficiently well drawn to make the environment seem alive. There’s a vibrancy and energy coming off the page from the environs – they’re plausible, detailed, complex, and suggest a living, breathing world around the protagonist. Amra, as a protagonist, is rather a lot of fun. She’s smart, quick, and interesting. Not a moral character, per se, but one with deep loyalties to friends. She’s a charming, pragmatic rogue, with a penchant for one-liners, and the ability to fight her way out of at least some of the sticky situations she ends up in. Over the course of the text, her loyalties are tested a little, and the reader gets to see her expand outside of her behavioural comfort zone – taking on a wider view, perhaps. In any event, she’s a lot of fun to read. There’s moments of icy calm, the kind of analytical thinking that keeps someone alive after a heist has gone dreadfully wrong. Then there’s the cheerful banter she shares with colleagues, and the more formal, focused approach she uses for clients and allies. Amra Thetys is a woman of many faces, but comes off as genuine beneath them all, a woman trying to make her way in a city that isn’t just full of bad people – but also rogue magic, daemonists, and other magical oddities. Then there’s Holgren, her on-again-off-again colleague, a man who qualifies as a magical oddity all on his own. Somewhat acerbic, with his own focus, which may or may not merge with Amra’s, Holgren is just as entertaining. He has a tendency to mix wry observations and grumpiness with the ability to make people explode from the inside, so clearly not a man to be trifled with. Whilst we’re seeing Amra grow here, as she tried to work out who wants to kill her this week and why, Holgren is a rock of certainty, a man settled into well maintained habits – and in embodying those habits, he feels entirely plausible, and, oddly, rather likable. There’s an assortment of other rapscallions here as well. I rather liked the competent, smooth, and somewhat dangerous feeling police inspector, and there’s a nobleman or two on the page who manage not to be total idiots in some fashion or other, which is rather nice. The feel from the villains is, in a lot of ways, more absolute – trying to get into their morals and motives is left secondary to watching them scheme, rampage, and generally slither in and cause havoc. Still, there are some careful nods in the direction of, if not grey areas of morality, at least a recognition that the villains of the piece also have their own points of view, that they may be the heroes in their own story. The plot – ah, I did love this. It feels like someone took a dram of Chandler and a soupcon of Hammett, and blended them into this fantasy world. The noir themes are strong, and there’s a delightful string of byzantine crosses, double crosses and triple crosses. Motivations are obscured, trust is hard to come by, and everyone seems to be looking out for number one. Then there’s some brilliant chase scenes, a sense of high stakes wrapped within an intriguing mystery – and a feeling that no-one and nothing is quite what it seems. Is it worth reading? Emphatically yes. It’s a clever, high energy book, with an absolutely top flight protagonist, and a plot which kicks off from the first page, and didn’t let me put it down thereafter. It’s a fantasy, a mystery, a character piece with an excellent plot – and really rather enjoyable. Give it a try. The Interminables, a debut novel from Paige Orwin, is an interesting blend of superheroic dystopia and action adventure. It’s got some very clever ideas in play, and a plausibly broken world. The story sits reasonably well in the world, with stakes high enough to keep you turning the page. The world is one in recovery, inching back from the precipice of disaster. Magic existed alongside what we think of as the ‘real’ world, keeping a low profile. Then a powerful entity burst back into the world, and shattered civilisation around it. Infrastructure crumbled, government consolidated, and a magical war erupted in an effort to preserve what remained of society. This is what’s left. The narrative sphere of interest is some of what is now the US east coast, significantly farther inland than it used to be. Orwin’s world is one on the edge of recovery, pulling itself up from the scars of a war which cracked the earth and left portions of the environment inimical. The author does a great job immersing us in this milieu, one of exhausted, driven individuals, slowly rebuilding what was lost, always with a wary eye on the possibility of greater horrors rising from the depths. In this case, the wary eye is cast by Edmund and Istvan. The former is, well, a wizard. He can avoid death, teleport, and cause all other manner of mayhem. There is, of course, a price for this kind of power – in part it’s driven by the moral regret and ethical quandary his use of power pushes upon him, and in part by…something else. Edmund exists in both a real and a narrative sense – he has a persona, a hero, and when embodying that persona, he is something more powerful than he is alone, whilst also becoming something perhaps a little less than human. Then there’s Edmund the man, a tired, shaky individual, suffering from stress and trauma brought on from surviving a war, dealing with the consequences one drink at a time, whilst trying to live up to his self-inflicted heroic mantle. Orwin’s portrayal of a man struggling to deal with his own survival is gentle, nuanced, and uncompromising. At his side we have Istvan – a stronger personification of the narrative principle, a conceptual embodiment of the Great War. He’s loyal, cares for his friends, and is bound in magical chains to prevent his eruption into a catastrophe of global proportions. Where Edmund is a study in contrasts, Istvan is an absolute looking for some dilution, a concept slowly learning to become a person. He doesn’t quite have the same kind of emotional heft as the somewhat-functional Edmund, but, paradoxically, contains a measure more of joi-de-vivre, his energy crackling off the page into the reader. They’re assisted by a diverse, if somewhat sprawling supporting cast, ranging from a cyborg with a hidden agenda to a hard-hitting force of nature, a researcher with a forthright attitude, and…a less than friendly cat. I would like to see more of these individuals – hopefully we’ll spend more time with them in any sequels – but they work as foils for our protagonists for now. The plot is decent enough. It takes a while to get rolling and introduce us to the characters, and there’s the occasional lull which could have done with spicing up a little. In part this is because there’s a struggle to explain everything that’s going on, quickly and concisely to the reader – by the close of the book, it was working well, but the early sections can limp a little until you’re up to speed. 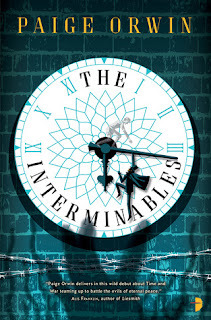 Still, at its best, this is an imaginative, fast-paced, buccaneering read, Indiana Jones with heroes, magical monstrosities, and with the fate of the world resting on the shoulders of our suffering heroes. Is it worth reading? Yes, I’d say so. The world is vivid and has as-yet unplumbed depths. Likewise the characters, which are delightfully flawed, and feel wonderfully real. The narrative stumbles a little out of the gate, but overall it grabs on to the attention, and rewards emotional investment with a strong payoff. If you’re looking for an entertaining piece of dystopian fiction, with magic and heroes and..er..a cat, then this will suit you very well indeed. I'm away today and unable to reach the web reliably, so we're having a momentary hiatus. Normal service will resume on Tuesday.